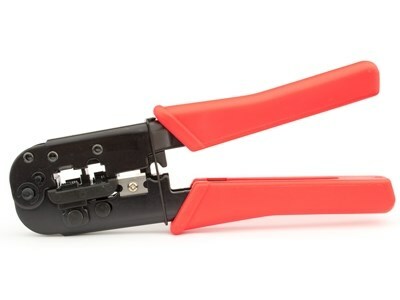 The CRT-1145D from Secure™ Cable Ties is a great solution for crimping RJ-11/45 connectors. This deluxe model features a lightweight steel frame that is both compact and durable. The CRT-1145D can handle 8P/8C and 6P/6C connectors. Keep this crimp tool from Secure™ Cable Ties close by for all of your network installation needs. The CRT-1145D can also save you time and money by allowing you to terminate your own cables to the exact lengths you need.